MORSE, S. E. - Asia. Asia. - MORSE, S. E.
Map maker : MORSE, S. E.. Date : New York, 1855. Size : 7.7 x 8.3 inches. / 19.5 x 21.0 cm. 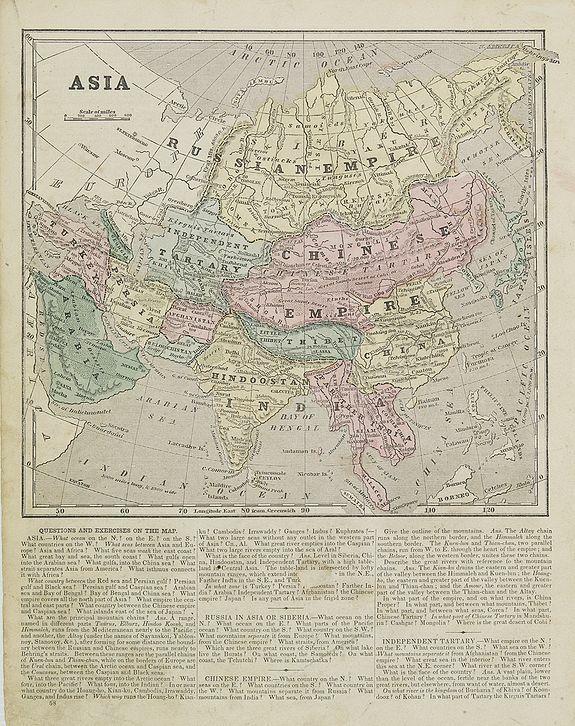 Description :Map of Asia encompassing the Russian Empire, the Chinese Empire, India Persia, Tartary, Turkey, and Arabia. From Sidney E. Morse''s: System of Geography for the use of schools , published by Harper and brothers, 329 Pearl Street, New York. An 150 years old map with accompanying questions and exerciser relating to the map. Descriptive text on both sides relating to Asia, Italy, Turkey and Greece. The map is an early example of cerography, or wax engraving. Sidney Morse and Samuel Breese invented cerography, which they began using in 1839. Morse tried to keep the process secret, but it became widely used in mapmaking, especially after Rand, McNally used wax engraving in 1872. Wax engraving remained an important map printing technique until the mid-twentieth century. Unlike engraving or lithography, which demanded the laborious drawing of a negative image, cerography allowed the image to be drawn directly the positive image is drawn onto a wax-covered plate that is then used as a mold from which a master printing plate is cast by an electroplating process. Images could be easily cut into the soft wax layer using very little pressure. See Woodward, David, The All-American Map: Wax Engraving and Its Influence on Cartography (Chicago, 1977). Condition : Cerographic map and on verso 7 historical wood-cut engravings. Paper slightly age-toned.